Lovely storm last night. Great flashes of lightning lighting up the whole sky in one go and sweet fragrant rain. I opened up the curtains and watched the show. The lights went out at 8.34. Only ten minutes though and they came back on. Further up the Coast they were blacked out for hours. Crap light for photos again today. 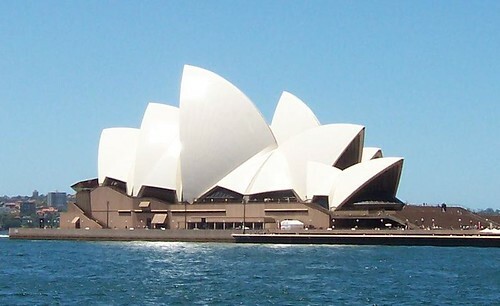 Here's a few from Sydney Harbour. Harbour ferries. 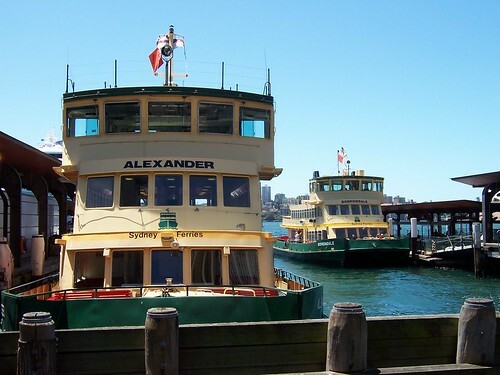 Alexander and Borrowdale and all the Harbour ferries of their size and livery are named after ships of the First Fleet, the ships what brought the first convicts in 1788. The first six carried convicts. The rest carried supplies and the Marines who became the colony's prison guards and police. Seven Seas Mariner that bloody great boat is called. One of them floating hotels. And the Coathanger in the background of course. 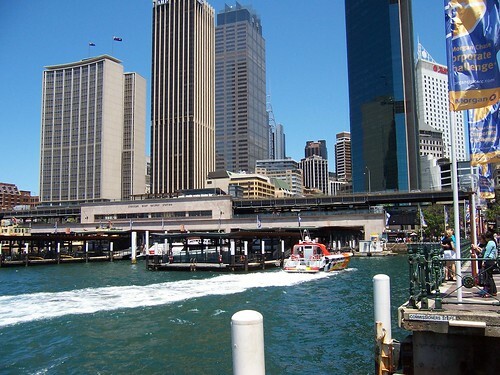 Midday traffic at Circular Quay. 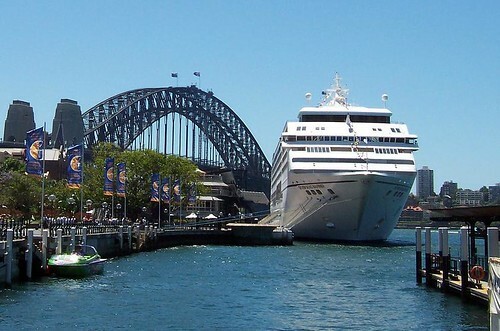 Harbour ferry, the Opera House and a tourist boat. 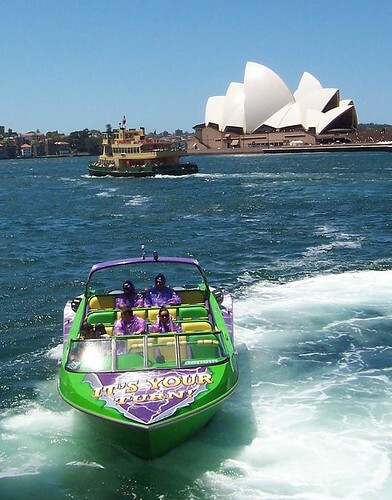 The tourists sit in the tourist boat dressed like purple condoms while it hurtles about the harbour like a mad thing and gives them a drowning and a thrill. Leaves from the old Harbour Master's Steps if I remember right. There yer go. The picture postcard view. A scrum of nuns, Clive James called it. Bloody hot day for a walk. Even with the midday breeze off Sydney Harbour. 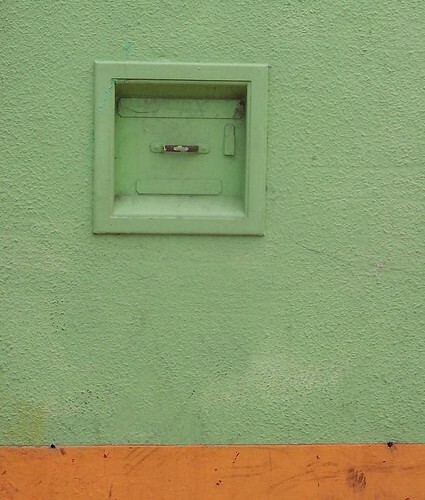 Forgot to blog yesterday but here's a treasure hunt post to be going on with. It was a marsh in 1788. That's when the Poms sent the first lot of convicts and soldiers to Port Jackson (Sydney Harbour) and Sydney was started. It was a tear-drop shaped marsh with its bottom in Hyde Park where I'm standing and its tip between Pitt and George Streets near Market Street. 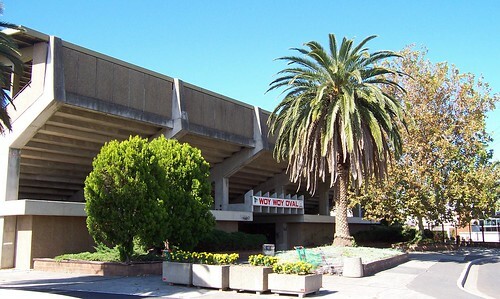 Get off the train at Town Hall, take the Park Street exit and go down Park Street to Hyde Park. 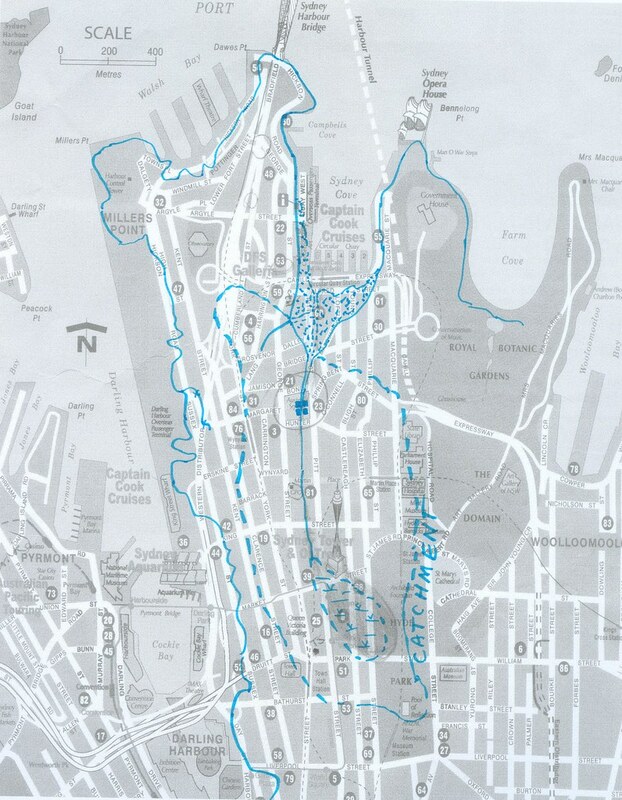 The blue lines are the 1788 shoreline of Sydney Cove (Circular Quay), the catchment area for the Tank Stream (larger area of broken line), the marsh at the head of the Stream (tear-drop shaped), the Tank Stream itself (centre), the tanks cut into the Stream (centre, circled) and the low tide banks at the mouth of the Stream (spotty areas). From Hyde Park, cross Elizabeth Street, go back along Park Street, turn down Castlereagh Street and walk one block north, towards the Bridge. This takes you across the middle of the old swamp. 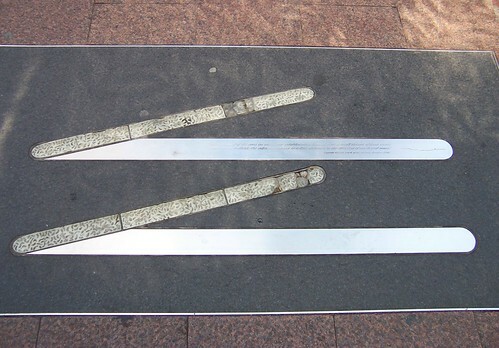 Marker #1. 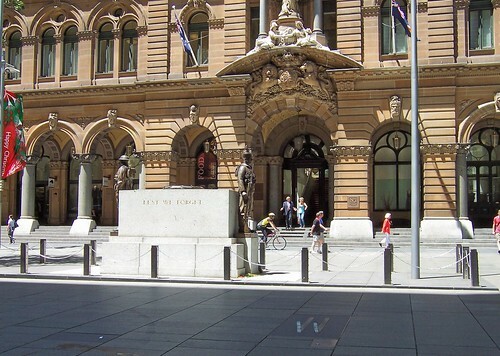 In the pavement at the entrance to Sydney Arcade, 185-189 Pitt Street. The textured stripes mark the direction of the Tank Stream in that spot. 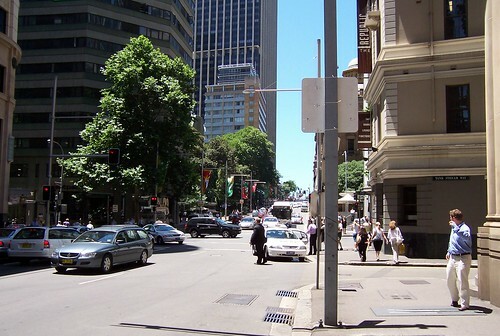 From the corner of Castlereagh Street and Market Street, walk west (towards George Street) along Market Street and turn downhill into Pitt Street. Sydney Arcade is on your left just before King Street. Captain Watkin Tench, of the Marines, January, 1788." The stream socially divided the settlement from the word go. The government bits were on the eastern side and the convicts lived on the western side. 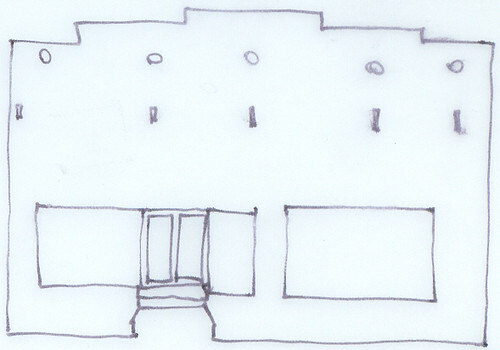 Marker #2. 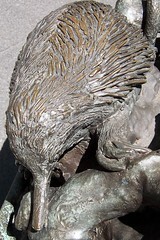 In the pavement next to the ANZAC Memorial AKA the Cenotaph, outside the GPO, Martin Place. You can see the marker in the right foreground of the photo. It looks like two ticks (checks). 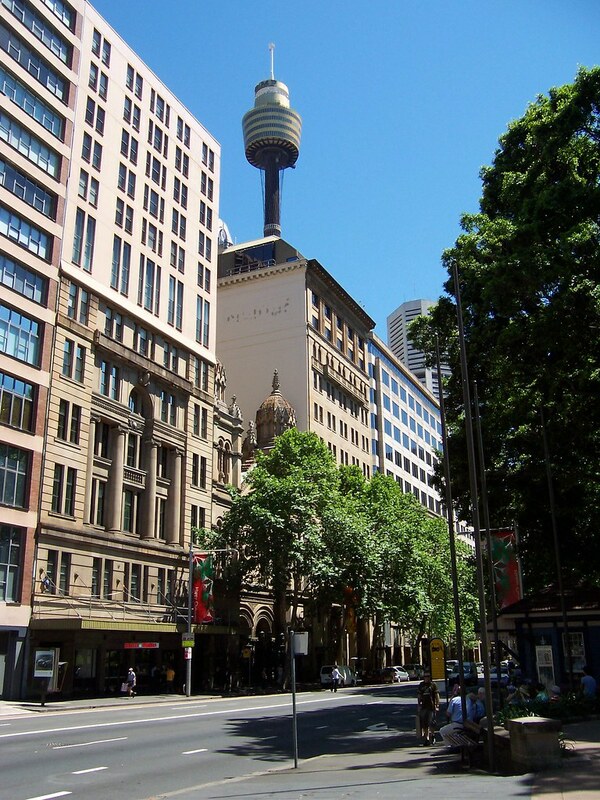 From Sydney Arcade, walk downhill towards the Harbour and turn left into Martin Place. Walk past the Christmas tree. 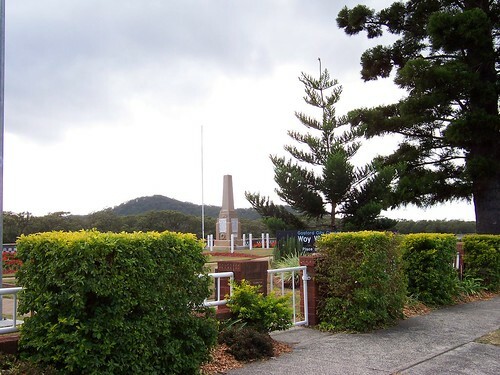 The marker is behind the ANZAC memorial. 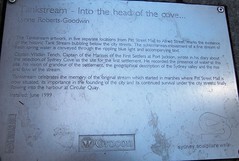 The Tankstream Artwork, in five separate locations from Pitt Street Mall to Alfred Street, marks the existence of the historic Tank Stream bubbling below the city streets. The subterranean movement of a fine stream of fresh spring water is conveyed through the rippling blue light and accompanying text. 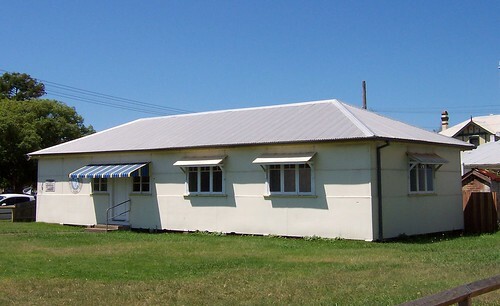 Captain Watkin Tench, Captain of the Marines of the First Settlers at Port Jackson, wrote in his diary about the selection of Sydney Cove as the site for the first settlement. 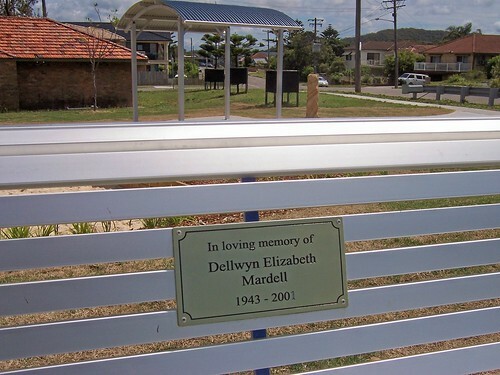 He recorded the presence of water at this site, his vision of grandeur of the settlement, the geographical description of the Sydney valley and the rise and flow of the stream. 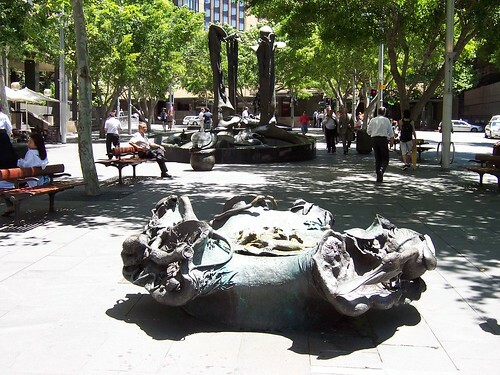 Tankstream celebrates the memory of the original stream which started in the marshes where the Pitt Street Mall is now situated, its importance in the founding of the city, finally flowing into the harbour at Circular Quay. Dunno about the rippling blue bit. The textured bits of the markers looked rippled but they're too grubby from foot traffic to be blue. They're nice anyways. Hunter Street at the corner of Pitt Street Sydney. On the Tank Stream underground tours the guides can tell they're near Hunter Street because the manhole covers rattle with the traffic. Marker #3. 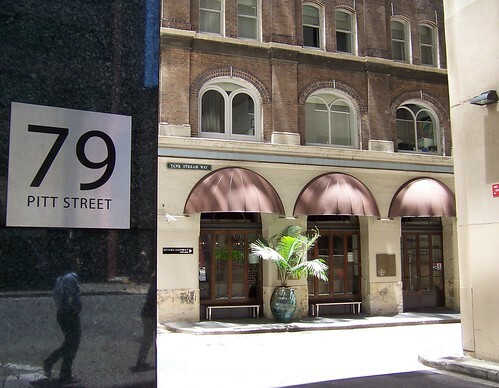 Curtin Place, off Pitt Street next to Australia Square. 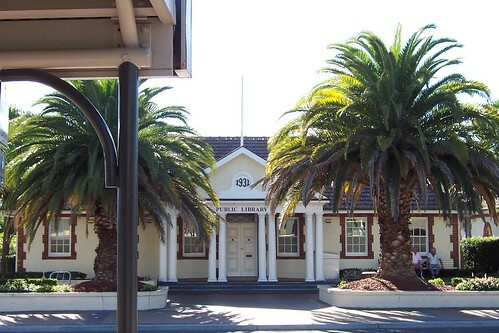 The tanks are under Australia Square. When the Tank Stream ran dry or low in drought Governor Philip ordered "tanks" cut into the sandstone bed of the stream to trap more water in the next good flow. The tanks cut into the sandstone base of the Tank Stream are under Australia Square, which is up those stairs. 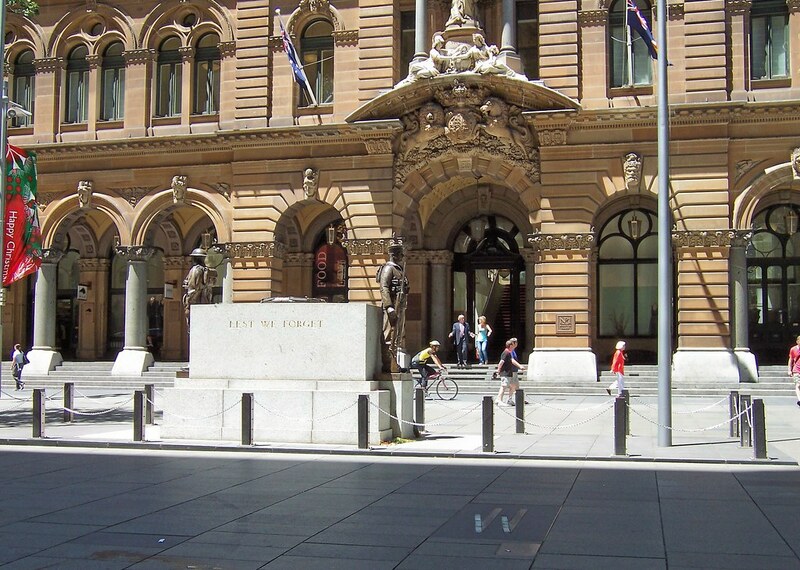 On January 26th, 1788, Governor Arthur Phillip landed on the shores of Sydney Cove. The selection of the site for the colony was influenced by the availability of a supply of fresh water from what became known as the Tank Stream. 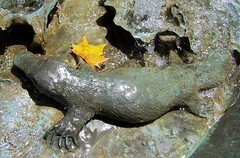 In 1790 the "tanks" from which the stream took its name were excavated in solid rock on both sides of the stream, close to the location of this plaque. The stream enetered the Cove at what is now Circular Quay and provided the colony with water until the early 1820's. The growth and development of the city during the middle of the 19th century led to the stream being progressively covered and now it carries stormwater. 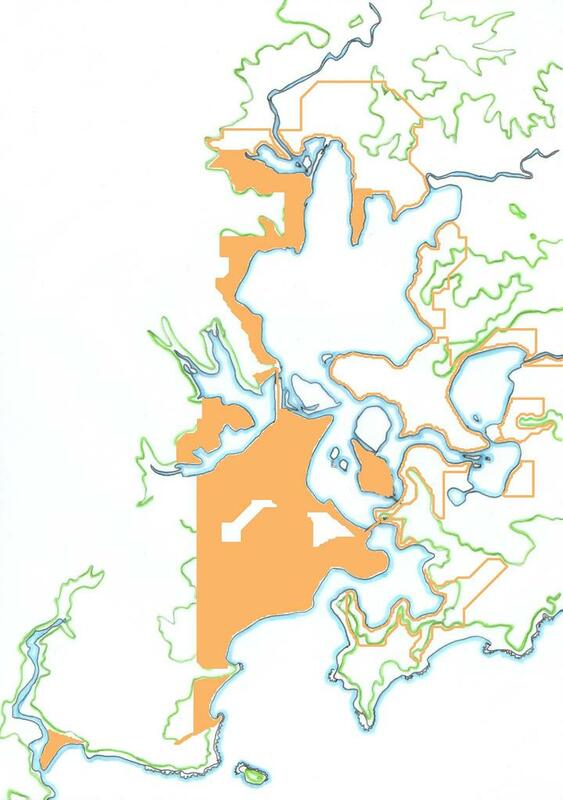 (Under the map:) Original course of the Tank Stream and the boundary of its catchment superimposed on the area today. 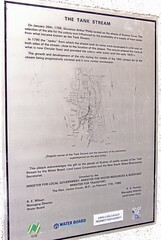 This plaque acknowldges the gift to the people of Sydney of public access to the Tank Stream by the Water Board, Lend Lease Corporation and the New South Wales Bicentennial Secretariat. The Hon. Janice Crosio, M.P., on February 17th, 1988." 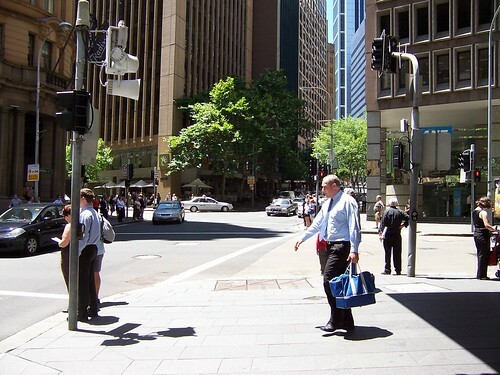 From Martin Place, walk down Pitt Street, past Hunter Street and into Curtin Place right before Australia Square. 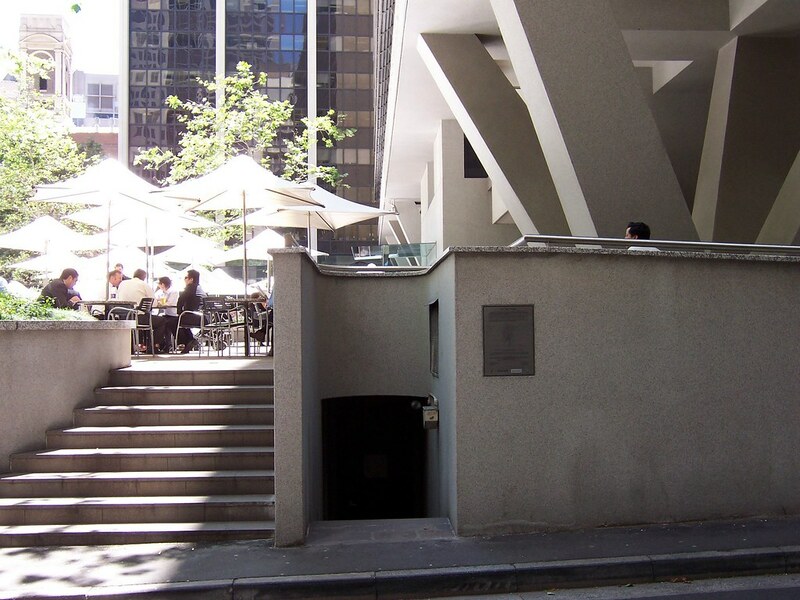 You're looking for an ordinary service access thingy next to the steps up to Australia Square's fountain. 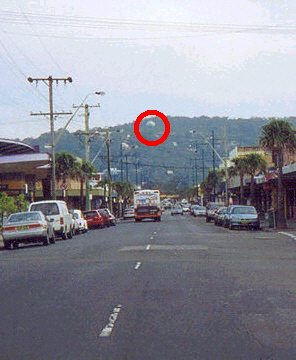 While you're in Curtin Place, look at the shape of it. By this time on the walk you can see you're in the shallow narrow gully that carries the Tank Stream. Tank Stream Bar in Tank Stream Way, off Pitt Street just past Australia Square. A watering hole over a stream. Very appropriate. Marker #4. 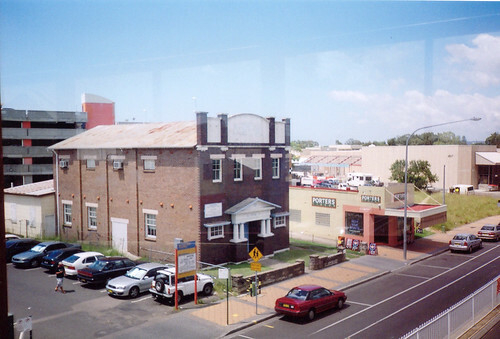 Bridge Street at the corner of Tank Stream Way. 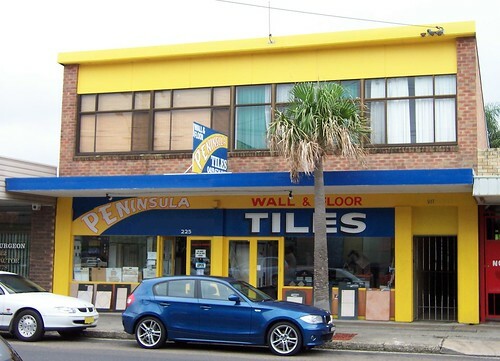 Tank Stream Way is an L-shaped lane from Pitt Street to Bridge Street. That's the marker just under Blue Shirt's feet and the end of Tank Stream Way behind him. 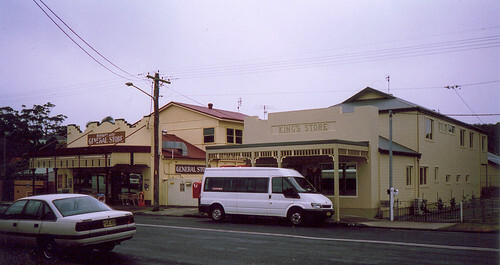 Bridge Street may be the site of the original bridge over the Tank Stream. I'm pretty sure of that but I'm too buggered to check. Marker #5. 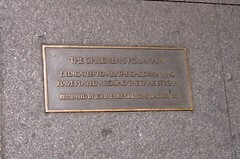 The Children's Fountain, Herald Square, Alfred Street, which is the street that runs along in front of Circular Quay, to the right of this photo. Dedicated to all the children who have played around the Tank Stream. Presented by John Fairfax & Sons Limited, 1981". 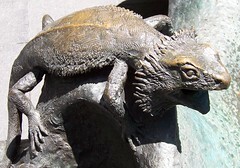 A few of the animals on the Children's Fountain. 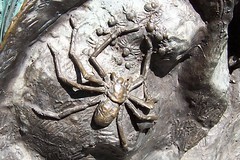 Platypus, spider, frill-necked lizard and echidna. 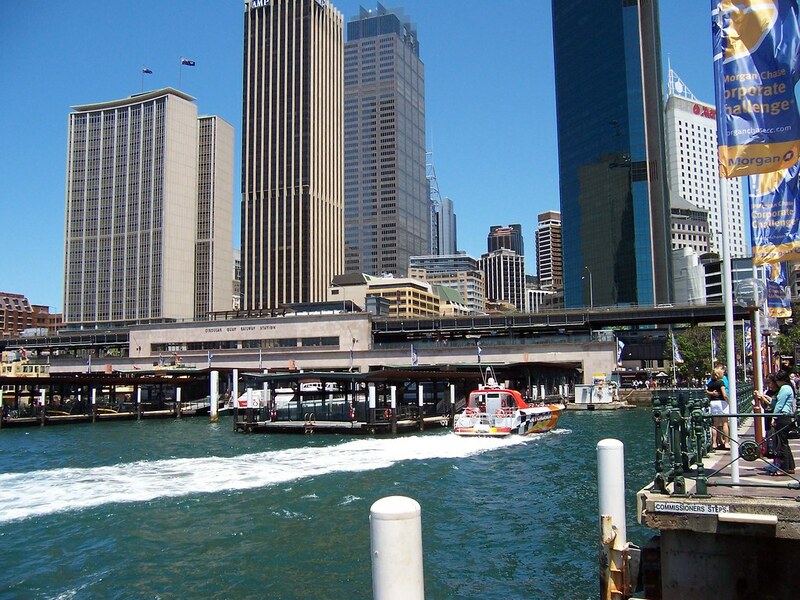 Circular Quay is Sydney Cove, the place where the First Fleet came ashore when they found fresh water in Port Jackson. 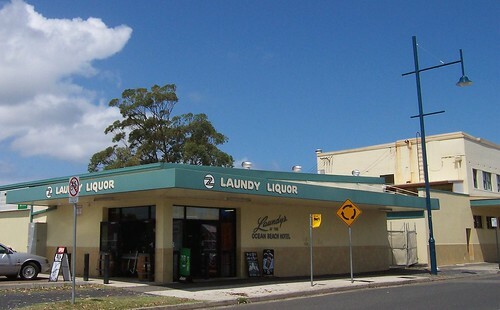 They set up camp there and from that camp Sydney grew. Where that orange and white boat is heading is around where the Tank Stream comes out, in its current incarnation as a stormwater drain. FactFiles has some good pictures of the Stream's history. Hope this post makes sense. Too tired to tell. Been a long day. It was good to get a walk in though and particularly to do the Tank Stream. I'm looking forward to doing it underground. That'll be a while. The tours are only twice yearly and there's a waiting list. By the way, I’ll be swapping to Tuesday and Thursday blogging for a bit instead of Monday, Wednesday, Friday. Lotsa offline crap to be done at the moment. Back on deck. Feeling like I've been slugged in an alley but that's the flu for yer. Managed to totter out for a walk this morning. Bloody hot day for it. 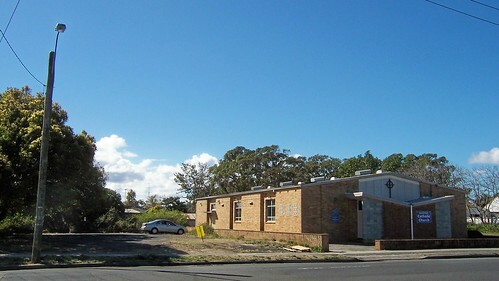 Naroo Road. 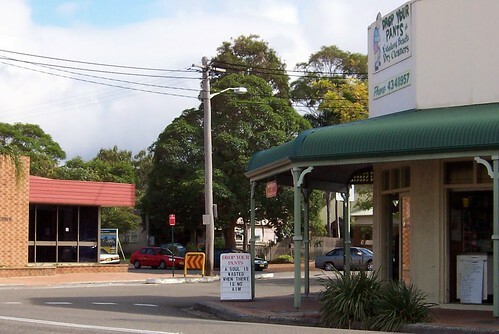 Tiny street off Veron Road in Umina, near the High School. A favourite site at this time of year. 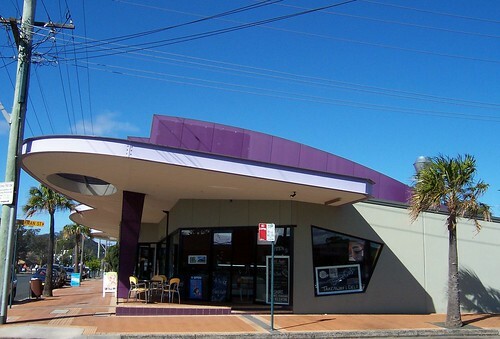 Locals often refer to it as Jacaranda Avenue. 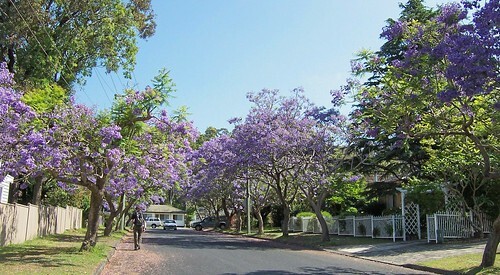 The jacarandas are still in flower all over the Peninsula. 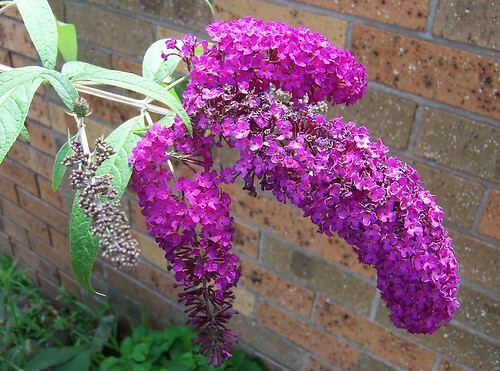 Love their soft trumpet-shaped flowers and their warm soft honey scent. Hot and hazy day on the Coast. That's just low cloud or leftover mist hanging over Sydney, not smog. Been foggy up and down the NSW coast for a few days. 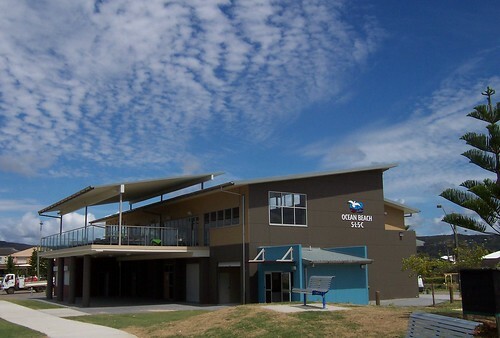 Taken from Ettalong Beach, near the dunnies at the end of Picnic Parade. Left to right: Wagstaffe (closeest), Barrenjoey Head (distant), Pittwater (most distant), Lion Island (right of centre), Commodore Heights in the Ku-ring-gai (behind the Lion), Ettalong Beach (closest) and Mt Ettalong (behind it). Pop over and have a gander at this wee old house on Mullet Creek. 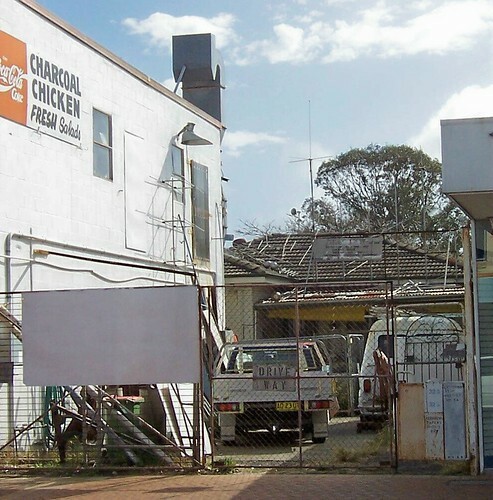 A Umina resident has snapped it from the train. 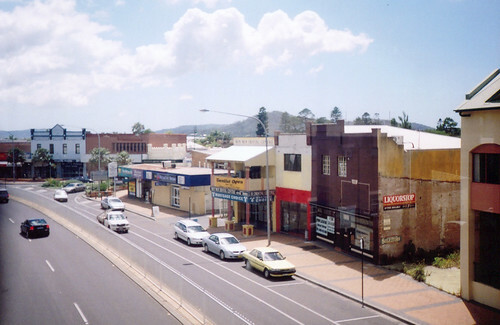 Mullet Creek is an offshoot of the Hawkesbury River, which is one of the branches of Broken Bay. 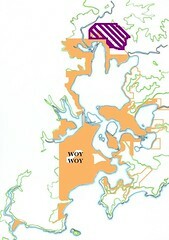 Woy Woy is in Brisbane Water and Brisbane Water is also part of Broken Bay. 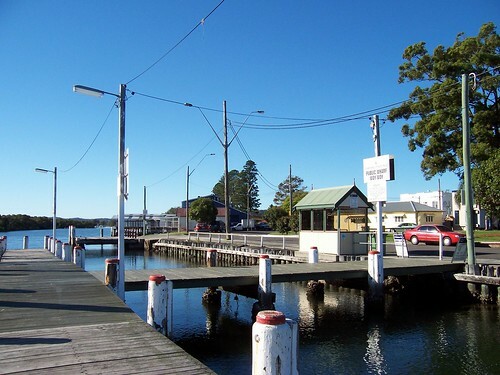 Mullet Creek is stoppered at its end by Dangar Island, which has electricity but only one car. Rumour has it this house has no electricity nor running water. Dear God! It's rather pleasant though and is either a late example of Old Colonial Georgian (1788 - circa 1840) or Victorian Georgian (circa 1840 - c.1890). I plump for Victorian. The area wasn't built in until the 1860s from what I can gather. 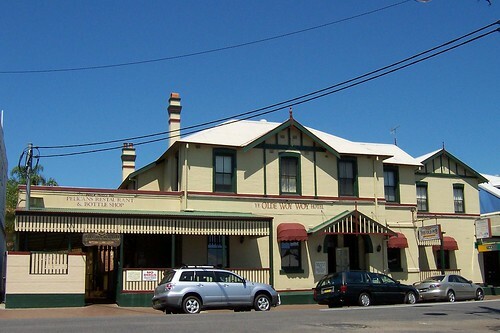 To get home its residents would have to get off at tiny Wondabyne station("passengers for Wondabyne please inform the guard and alight from the rear door or the rear carriage") or row for 20 minutes from Brooklyn township. 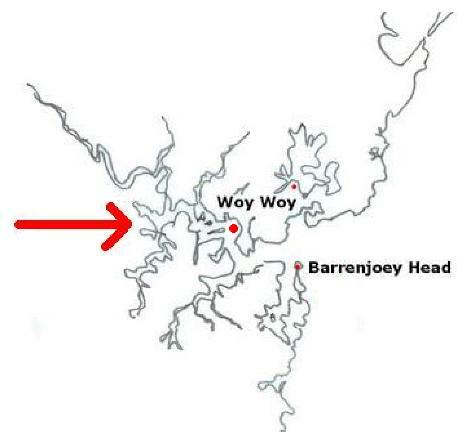 Dangar Island is the red dot the arrow is pointing at. Mullet Creek is the wee offshoot of river rising vertically above it and half obscured by the name of Woy Woy.